High-resolution projections of climate change impacts on fire weather conditions in southeast Australia out to 2080 are presented. Fire weather is represented by the McArthur Forest Fire Danger Index (FFDI), calculated from an objectively designed regional climate model ensemble. Changes in annual cumulative FFDI vary widely, from − 337 (− 21%) to + 657 (+ 24%) in coastal areas and − 237 (− 12%) to + 1143 (+ 26%) in inland areas. A similar spread is projected in extreme FFDI values. In coastal regions, the number of prescribed burning days is projected to change from − 11 to + 10 in autumn and − 10 to + 3 in spring. Across the ensemble, the most significant increases in fire weather and decreases in prescribed burn windows are projected to take place in spring. Partial bias correction of FFDI leads to similar projections but with a greater spread, particularly in extreme values. The partially bias-corrected FFDI performs similarly to uncorrected FFDI compared to the observed annual cumulative FFDI (ensemble root mean square error spans 540 to 1583 for uncorrected output and 695 to 1398 for corrected) but is generally worse for FFDI values above 50. This emphasizes the need to consider inter-variable relationships when bias-correcting for complex phenomena such as fire weather. There is considerable uncertainty in the future trajectory of fire weather in southeast Australia, including the potential for less prescribed burning days and substantially greater fire danger in spring. 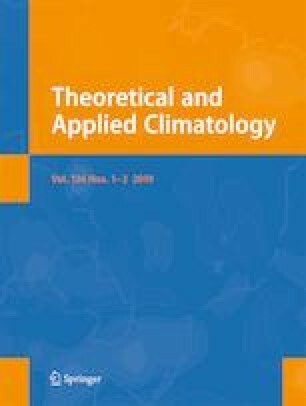 Selecting climate models on the basis of multiple criteria can lead to more informative projections and allow an explicit exploration of uncertainty. The online version of this article ( https://doi.org/10.1007/s00704-018-2507-4) contains supplementary material, which is available to authorized users. This study was supported by the ARC Centre of Excellence for Climate System Science (CE110001028) and by the NCI National Facility at the Australian National University, Australia. Regional climate data have been provided by the New South Wales and Australian Capital Territory Regional Climate Model (NARCLiM) project funded by NSW Government Office of Environment and Heritage, University of New South Wales Climate Change Research Centre, ACT Government Environment and Sustainable Development Directorate and other project partners. Jason Evans was funded by the ARC Future Fellowship FT110100576 and by the Australian Federal Government through the National Environmental Science Programme.